"Farming looks mighty easy when your plow is a pencil and you're a thousand miles from the field." 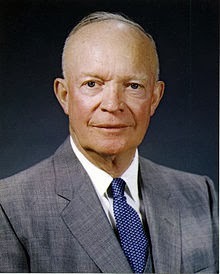 I like Ike. In many ways, the agricultural cycle of planting, nurturing, and ultimately harvesting is similar to the business cycle. To readers who are unfamiliar with the business cycle, the premise is that our economic system is based on a boom and bust paradigm. This theory identifies the cyclicality of the economy in terms of growth, credit availability, profits, losses, booms, and busts. Historically, the business cycle was facilitated by the primary function of credit; if there was ample credit to be had at a reasonable rates, then the economic conditions would generally improve or grow. When credit became too easy, the economy then entered a far faster growth spurt than could be sustained. This became known as the boom part of the cycle. Inevitably, and history is replete with numerous examples, this boom ultimately led to a bust. Credit availability tightens. Real asset prices fall. Typically when this "adjustment" occurs it is swift and extremely disruptive, a herd mentality prevails where every investor heads for the exits simultaneously. In the the bust period, there are few bids on assets as the herd is trying to sell at any price. Farmers flush with cash need take note of this scenario. This is the proverbial "bust" period. I repeat, as the heard is trying to sell, often at any price, there are few bids on assets. A prudent financial farmer always has boring old cash handy, he knows full well purchasing during a bust may have exponential returns in the years and decades that follow. That last sentence is worth your time to read twice. Historically speaking, busts (those intense periods of rapid, unmitigated dumping of assets) are usually short-lived. And that makes sense, because intense periods of volatility in-and-of themselves are very unstable. The boom and bust cycles are at constant odds with "the average" or mean, which is why the term "reversion to the mean" is so powerful. This average can apply to a host of scenarios, from real estate, stocks, and yes, of course, farming. Investing like a farmer implies an understanding of both the above-mentioned business and agricultural cycles. The value of understanding, respecting, and acting on the cyclicality of events is vital. The reason why literally hundreds of millions of dollars are spent each year on research is that investors are constantly seeking some foresight into what will happen next. Crystal ball or not, fortune-telling is big business. Although by no means perfect, understanding the cyclicality of events, the business seasons, is akin to having a trusty farmer's almanac handy. With an appreciation for what might happen next, the financial farmer needs to act decisively. What to plant. How to plant it. Why to plant it. When to harvest it. A whole host of questions need to be answered, but they need to be determined far ahead of the actual planting. It is this very thought process that this blog will hopefully help you develop.